My parents decided to homeschool me while growing up in Tulsa, Okla., because they didn’t trust the teachings of the public school system. The curriculum we studied rigorously at home everyday was Bible-based and, looking back on it now, I realize that many of the teachings were rooted in fear. A fear that confused me as a young, queer person. I knew when I was seven years old that I adored women — actually I worshiped them. My crushes on girls at church were immense and I’d draw them pictures, braid them “friendship” bracelets, and write them notes. One memory seared into my brain is of me sitting next to one of my friends in church one day and feeling her body heat so close to me that the hair on my arms stood up and I felt giddy and tingly all over. I remember most not wanting the sermon to end. I’d read in the Bible that homosexuality was a grave sin, and that any “Man that lie with another man,” should be put to death. So, I believed that hell waited for me if I acted on my impulses, which meant I spent most of my time fantasizing. When I was 13, my family moved to Honduras because my dad felt God calling him to be a missionary. While I was still sheltered, I saw a lot more of the “real” world there. One day, I found the Latin version of MTV and I’d sneak out of my room at night and watch it while everyone was asleep. 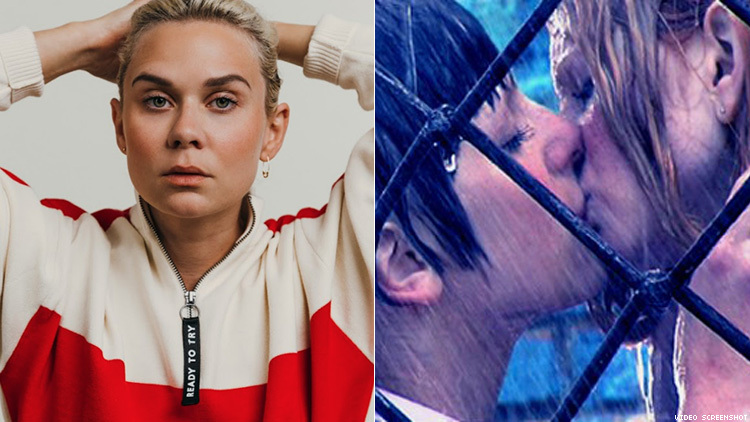 During one particular night of binging the channel in private, I saw a music video by t.a.T.u where two school girls in uniforms are kissing each other out in the rain — and it gave me hope. I was seeing my fantasies acted out in real life, and through this representation I was able to unpack all the hopes and dreams I’d neatly folded for another life. I suddenly had the hope of finding love, the hope of being intimate with someone, and the hope of being myself in front of people and it being okay. And more than anything, it let me know that there were other girls like me. Over the years, I had to burn a couple copies of "All the Things She Said" on Kazaa because several of them were confiscated, but I held onto that dreamy imagery and rebelled quietly. But soon after, I began to write poems and song lyrics about women, and I’d even take my brother’s Sunday suit into the bathroom, lock the door, put it on and stare at myself in the mirror for 30 minutes. Eventually, I came out to my parents at 16. At the time, they thought it was a rebellious phase but I just kept steadily reminding them over the years, that this is who I am. I’ve introduced them to "best friends" and "roommates" that I’ve dated over the years, and just recently I introduced them to my fiancee. My parents have made great steps toward accepting me and loving me unconditionally — despite what the church has to say. And I know they’ve received criticism about it, with some folks going as far as withdrawing support from my parents’ mission in Honduras. While I do feel guilty about that, I do believe in God now and I don’t think she relies on “conditional” support anyway. I know this because of my own life, my own journey and because of the ways that one t.a.T.u one music video gave me a way of imagining the life I love today. Ames is a singer and songwriter who penned songs for Kelly Clarkson, Icona Pop, and Rita Ora. Ames just released her debut EP, My Name Is Ames. Follow Ames on Twitter @MyNameIsAmes and Instagram @MyNameIsAmes.